Heat olive oil in large sauce pan. Add finely chopped garlic and onion. Saute on med heat untill onions are translucent. Add oregano, thyme, rosemary and balsamic vinegar. Lower heat and saute fo 10 min. to reduce mixture. Add tomatos, pepper flakes, Basil, and sugar. Bring to a boil and simmer on low heat for 30 minutes. Top with grated romano or parmesan cheese. Made this today. 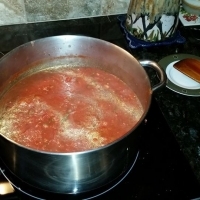 Only change was I did add a couple of tables spoons of tomato paste as I needed a thicker sauce. Came out beautifully. This is so good! I have made it twice now and it is to die for delicious!!! If I could give it a ten I would. Like smokinrj's recipes? Never miss an upload!